Many of us would love to receive the benefits of healing crystals but have difficulty making time for meditation. The VitaJuwel ViA Gemwater Bottle is the easiest way to integrate the energy of crystals into your body at a cellular and vibrational level. Our stylish glass bottle uses a revolutionary gempod that works as a natural prism, instilling your drinking water with the energy of crystals to enhance health & wellness as well as aid in relaxation. You will also receive a sturdy Neoprene sleeve to protect your bottle and insulate drinking water. Also included with your bottle are 2 tumble-polished healing stones and a 2" x 3" black velvet drawstring bag. Carry these with you or add them to your meditation and purifying rituals. All you need is ... water. And when you add rose quartz, the quintessential stone of love, anything is possible! Rose quartz is used by experts to release emotional wounds and traumas, to balance emotions and bring peace and calm. This balance is said to relief stress and ease anxiety. For water lovers, this is the perfect blend. We insist on the highest quality materials and manufacturing processes to bring you the VitaJuwel ViA Gemwater Bottle. We confidently offer a 30 Day Money-Back Guarantee for your peace of mind. In the unlikely event that our product does not meet your expectations, return it for a full refund of your purchase price. Infuse your body with the healing and energetic power of crystals. Add the VitaJuwel ViA Gemwater Cupid'S Kiss Bundle to your cart today. 5-PIECE GEMWATER BUNDLE includes our Cupid's Kiss VitaJuwel ViA Glass Water Bottle; Neoprene sleeve to insulate water and protect your bottle; 2 tumbler polished worry stones; and a 2" x 3" velvet drawstring pouch. IMPROVE OXYGEN CONTENT and pH value while increasing bioavailability of minerals. Our Gemwater Bottlers are Mother Nature's finest water filters and purifiers. INNOVATIVE GEMPOD ensures our carefully selected crystals never come into contact with your water, so they remain bright and shiny. The gempod acts as a natural prism for the crystals' subtle vibrations. NEOPRENE HUG SLEEVE helps to maintain drinking water at a cool, refreshing temperature. 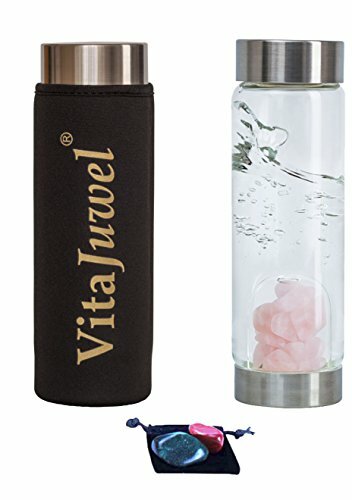 It also cushions your VitaJuwel Bottle from impacts. Always hand-wash your bottle and its Neoprene sleeve. 34 DAY MONEY BACK GUARANTEE ensures your satisfaction. If you don't enjoy rejuvenating energy balance from our VitaJuwel Bottle, return it for a 100% refund of your purchase price, no questions asked.